So, for the recipe for these wonderful little boats…just keep reading! Start by slicing the zucchini in half lengthwise. Hollow out the zucchini using either a melon baller or a spoon. Set the zucchini boats (the hollow shells) in a baking dish to the side. 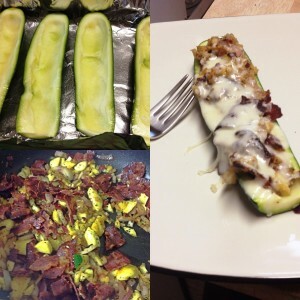 Take the insides of the zucchini and give them a chop, along with the turkey bacon, onion, and garlic. In a skillet, saute the zucchini, turkey bacon, onion, and garlic for 5-7 minutes (or until bacon in done). In a bowl, stir together the bacon mixture, parmesan cheese, and seasonings. Scoop onto the zucchini boats. Place stuffed zucchini in oven for 15-20 minutes. Remove from oven, top with mozzarella cheese and return to oven for 2 minutes. I think next time, I will serve these will a little side of spicy marinara sauce. What would you serve with your bacon stuffed zucchini?? ?